Riding on the Enfield towards the KR Market area is quit an awesome feeling. Am I joking? Try yourself at 6 am. Other times it is no fun. Reading many food blogs will only aggravate the hunger. This practice is very dangerous because the false hunger will lead to acidity or over eating. After reading about the N V Naidu hotel in one of the blogs, I took off from the city centre during the lunch hour. It was not at all difficult to trace the humble Naidu hotel that has been here since more than two decades. 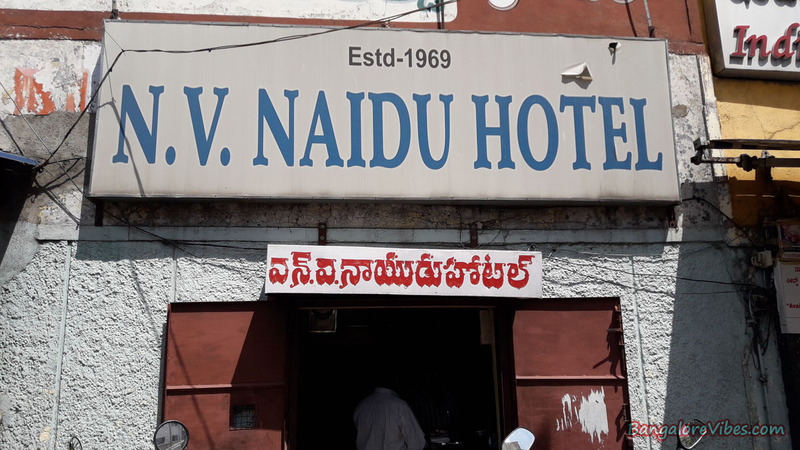 Note that the N V Naidu hotel is a restaurant and not a hotel. Hotel is a place that provides both meals and accommodation whereas this restaurant does not provide accommodation. Motorcycle parking is not an issue. When I was searching for one, the restaurant staff signalled me to park right in front of the restaurant, apparently a walkway for public. From the view inside, I would say that the N V Naidu restaurant building is certainly more than 40 years old. The cashier sits in the front hall facing the road. This hall has two tables. There is another hall, bigger in size with a kitchen attached. (Did I notice this?) One has to walk until here to wash the hands before meal. The menu, hanged on the wall, has a good list of non-vegetarian items. I ordered for the Chicken Biryani. 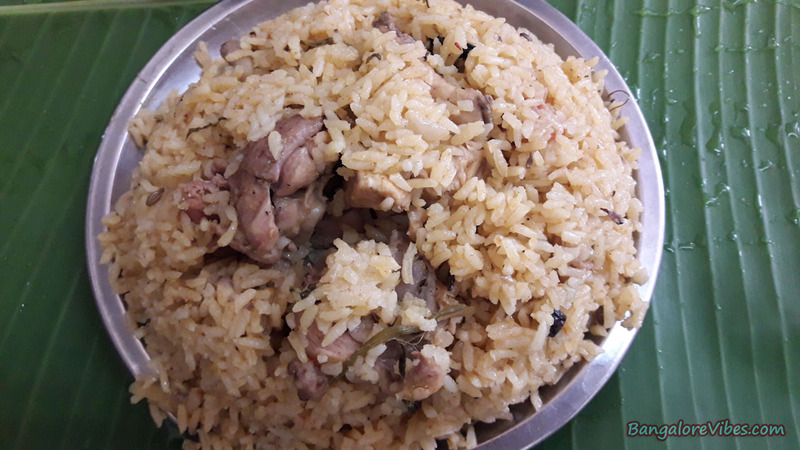 I am not a chef but I do understand that there are varieties of rice that are favourable for cooking biryani. Thanks to their unique flavours. N V Naidu hotel uses none of the above rice varieties. I assume, they use regular variety, may be a special one. 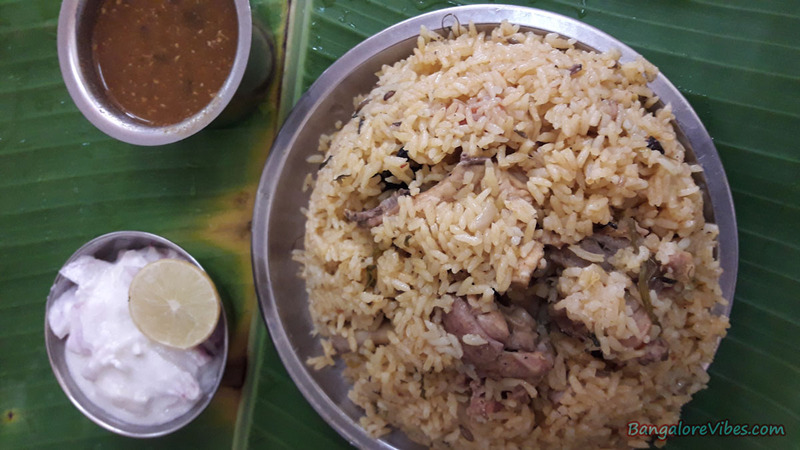 The chicken biryani in N V Naidu hotel is enjoyable. If you like spicy food, you will enjoy it too. The chicken was well cooked; it did not hurt the gums. Price wise, I feel it to be on the higher side because the rate is similar to those that of bigger restaurants with much better ambience and facilities. Read my post about the Savoury restaurant in Mosque road. The N V Naidu hotel is a Military Hotel types, it is in kalasipalya Main Road. If you are planning to go there, Google map embedded below for your convenience. Kalasipalya has a historical background, learn from Wikipedia. Nice post. Thanks for your awesome articles which really help to get the best food in Bangalore.